I absolutely loved this book! It was captivating from the very beginning. I fell in love with each of the children in the family, and also with Lorna and Jon. It had mystery, suspense, fun, romance, and I coudln't wait to find out how the lives of both intertwined. I would recommend this book to all readers of mystery, romance, and historical fiction. A very, VERY good read. A secret history. A long-ago summer. A house with an untold story. 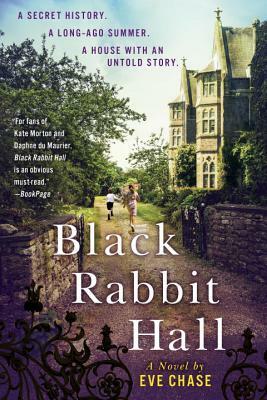 Amber Alton knows that the hours pass differently at Black Rabbit Hall, her London family’s Cornish country house, where no two clocks read the same. Summers there are perfect, timeless. Not much ever happens. Until, one terrible day, it does. More than three decades later, Lorna is determined to be married within the grand, ivy-covered walls of Pencraw Hall, known as Black Rabbit Hall among the locals. But as she’s drawn deeper into the overgrown grounds, she soon finds herself ensnared within the house’s labyrinthine history, overcome with a need for answers about her own past and that of the once-golden family whose memory still haunts the estate. Eve Chase's debut novel is a thrilling spiral into the hearts of two women separated by decades but inescapably linked by the dark and tangled secrets of Black Rabbit Hall. Eve Chase is an exciting new voice in fiction. She lives in Oxford, England with her husband and three children.